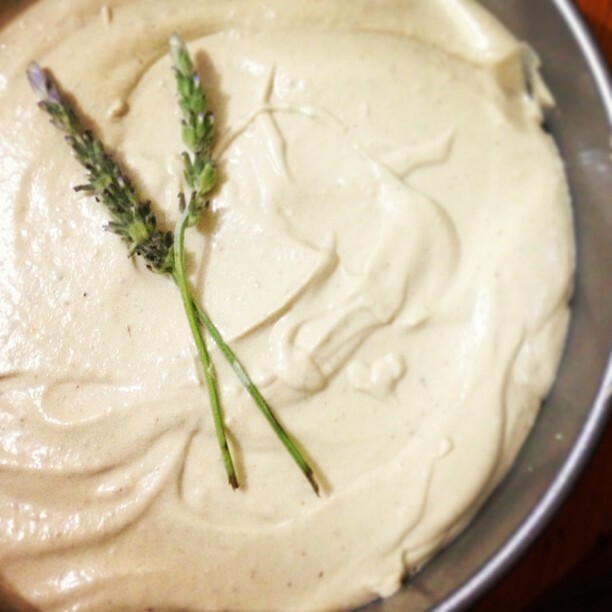 Salad Days: lavender, lemon and white chocolate cheesecake - raw, vegan! lavender, lemon and white chocolate cheesecake - raw, vegan! I do love a bit of witchy kitchen dabblings, and even better when it leads to decadent desserts! This recipe involved quite a bit of foraging in order to obtain the lavender required; although I use tincture of Lavendula officinalis frequently as a naturopath and herbalist in clinical practice (wonderfully soothing and relaxing), getting my hands on the real deal proved a little difficult at this time of the year. Eventually, I stumbled upon some whilst nerding out at the Ceres medicinal herb garden and the rest, as they say, was history. This raw cheesecake was created for a friend's birthday, who reacted incredibly well upon spying it in the green bag I handed it to her in (there was squeals, hugs). Have fun creating this for a friend, for your family...or for yourself! If you experience difficulty finding fresh lavender from a reliable source (ie. you know it has not been sprayed with chemicals), you can substitute with 5-10 drops of lavender essential oil (depending on how floral-y you want your cheesecake to taste!). In a food processor or high powered blender (hello, Thermomix!) blend everything until sticky and crumbly, with no big chunks or lumps. Press the contents into a 9 inch spring-form pan evenly and put aside until you are ready to fill it. Once more, blend everything until smooth and creamy - this took approximately two minutes in my Thermomix. You may have to scrape down the sides now and then, but perservere until you get that wonderful, silky texture. Place the filling into the pan and distribute evenly over the crust. Place in the freezer for approximately 6-8 hours (or longer) and remove about 1-2 hours before serving. Decorate as you like - some coconut shavings, hazelnuts, strawberries or whatnot would look adorable! Give to people and watch them fuss over it, and you.